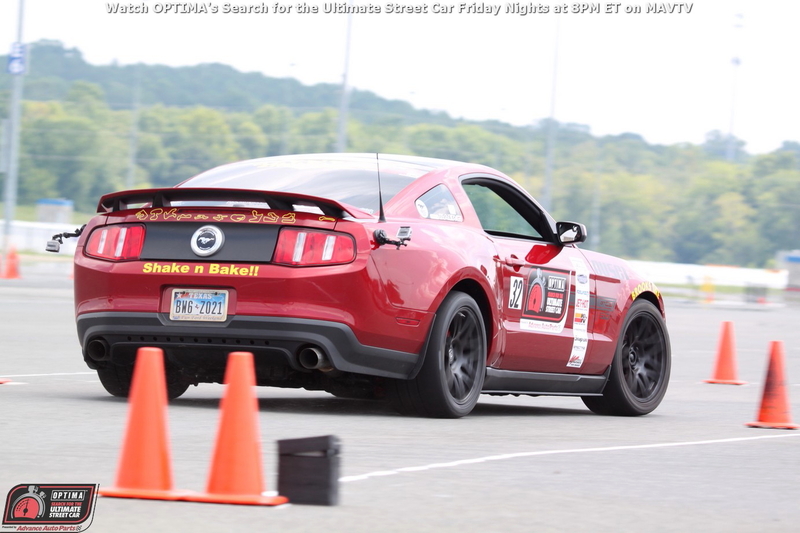 We're now eight events into the nine-event series known as OPTIMA's Search for the Ultimate Street Car, presented by Advance Auto Parts. The end goals are two-fold- win the season points championship in one of four classes- GTV, GTS, GTL or GT and win an invitation to the SEMA show and the biggest street car event in the country, the OPTIMA Ultimate Street Car Invitational. The first goal is in sight for several competitors, but the second goal remains very uncertain for many others. The top competitor in each of the four classes, who has not yet received an invitation to the 2015 OUSCI will receive one at the conclusion of the regular season and the next 11 competitors based on points (and regardless of class) will also receive invitations. Even though the most-recent qualifying event at Road America was a single-points event, we saw significant movement among the contenders for those final 15 spots. With the last qualifying event at Auto Club Speedway on October 10th and 11th being a double-points event, we expect dramatic shifts in the final standings. Some competitors near the top are in fairly good shape, whether they run in the final event or not. Others, like Martin Pond, could end up winning the season-long points championship in the GTL class with a strong performance or he could fall out of the top-15 entirely if he doesn't show up in Fontana. Ryan Volk, Mike Du Sold and Rob MacGregor's invitations at the Road America event were critical for those in the points chase, as all had the potential to finish the season in one of the 15 points positions. Four more invitations will be handed out at Fontana across the four classes, which could free up additional spots. Rank Name Car Points Class Change Fontana? Even laying these numbers out and doing some simple math won't tell us how this will all turn out. Some of the final qualifying spots will simply be determined on the track. While Andrew Nier could move up significantly in the standings, a third of the entire field at Fontana (25 cars) is registered in the GT class, which will make it very difficult to accumulate points. GT class heavyweights including Bryan Johnson, Jordan Priestley, Ken Thwaits and Ryan Volk will all be there consuming points, even though they've already qualified for the OUSCI. With that being the case, Nier may set his sights on simply being the highest-finishing, non-qualifier, which would earn him his invitation at the event. However, Nier won't be alone in that regard, as Cliff Elliott's Mustang, Chandler Premo's BMW M3 and Dannie Pinard's Camaro will all be joining him in that quest for a qualifying spot. The GTL class may be smaller at Fontana with just 16 competitors registered, but the quality is certainly present, with Danny Popp, Douglas Wind, Rich Willhoff, John Lazorack III, Bob Boileau and Karl Dunn all assigned to the Expert run group and only Popp Wind in the catbird's seat in terms of an OUSCI invite. A battle is sure to ensue, as Boileau's only chance to make the OUSCI is to win his way in, while Willhoff and Lazorack III aren't sitting much better. If they can bump someone out of the field of 15 qualifiers, they'll likely need to finish the season North of 400 points, which will require their best performances of the season. The GTS class is even smaller, but fraught with uncertainty for Bob Denny. The known entities are Brian Hobaugh, Hugh Bate and Rick Hoback, who can all consume vast quantities of points in that class. The mystery comes in the less-familiar names- Jonathan Chu in a Nissan GT-R and the Corvettes of Kanan Gubins and Mike Ryan. If they turn out to be ringers and nab the qualifying spot, will enough points remain for Bob Denny to climb his way into the top-15? The GTV class will be a different story entirely, as most of the top GTV cars registered for Fontana have either qualified for the OUSCI already or nearly have a lock on an invite by virtue of their point total on the season. A whopping 33 GTV cars will battle it out and the winner that emerges from that class will surely have earned their invite. That also bodes well for the other three classes, as the points are likely to be distributed more evenly in GTV and minimize the impact on the chase for those 15 spots. That could also spell trouble for Mike Hamrick and his 1966 Ford Mustang. Hamrick has competed in four events, but only one double-points event. Fontana will be his second, but with such a large field, he may struggle to gain enough points to make the field of 15 qualifiers. If he does, that might not bode well for competitors as high as Keith Corrigan and Bradley Yonkers. The wildcard scenario in all of this is if someone looking to point their way into the OUSCI were to win their class or grabbed the qualifying spot for it at Fontana. For every borderline competitor who is able to win their way in at Fontana, every other non-qualifier moves up a spot on the ladder, which could be a total of four potential spots. Much is yet to be decided and you won't want to miss a moment of the action. Watch OPTIMA's Search for the Ultimate Street Car every Friday night at 8PM ET/PT on MAVTV and if you're going to be in Southern California on the weekend of October 10th, make plans to see this event in person and buy your VIP Pit Passes today!